Finger guard runs the entire length of the blade. 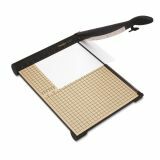 Martin Yale Premier Sharpcut 15" Paper Cutter - Sharpcut Trimmer features a self-sharpening stainless steel blade that cuts up to 15 sheets at once. 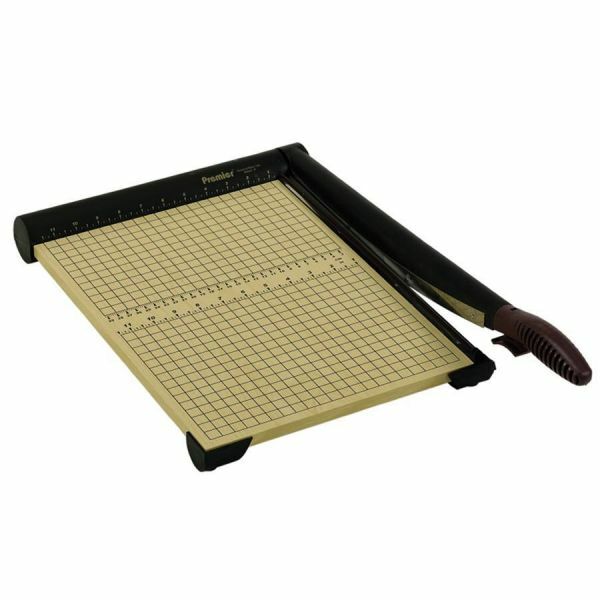 Heavy 1/2 wood base offers permanent alignment grid for precise cuts. Trimmer has Imperial and metric rulers, patented automatic blade locking system, torsion spring and fingerguard for safety." Clamp securely holds stacks for accurate cutting. 1/2" thick wood base with nonskid rubber feet.